Where will your travel dreams take you and your family during this school year? We believe travel is a great way to learn and bond with family and friends. As you pull your calendar out this month and begin noting important dates throughout the year, remember to give us a call to start on planning your family holiday. Let us plan your Wild Week of Adventure in Kenya with a stop at Giraffe Manor, a lovely ten-room house where "Out of Africa" ambiance is blended with casual elegance. Upon arrival you will be met by the resident Rothschild Giraffe who roam the grounds of the sanctuary surrounding this classic manor house. 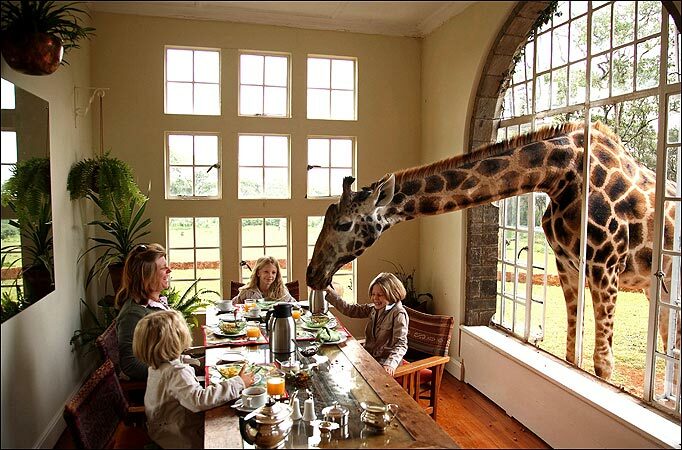 The giraffes are completely wild, but enjoy being fed by guests, making this an experience unlike any other in the world. Visit the Giraffe Centre located within the Manor's grounds or take a trip to the David Sheldrick Wildlife Trust and see orphaned elephants and rhinoceros. The Karen Blixen Museum offers a glimpse into the life of the author of the infamous book "Out of Africa" and en-route you will have a chance to purchase gifts from local designers and artisans. The is an enchanting experience that we can combine with other idyllic locations on your journey through Kenya. Cruising the Galapagos Islands is a perfect adventure for families and is available all year round. Who doesn't want to see the Blue Footed Booby's, walk among giant tortoises, kayak and snorkel with marine iguanas and sea lions, and get amazing photos of wildlife. Many of our partners in the Galapagos offer child-friendly programs and activities including scavenger hunts, Spanish lessons and art-making in addition to wildlife exploration. Ecoventura, a partner dedicated to providing travelers with inspiring, hands-on experiences, has launched the MV Origin to their award-winning fleet. The Origin is the most comfortable and luxurious yacht operating in the Galapagos today. Designated family departures offered over school breaks feature activities tailored to the children on board. Talented naturalists balance learning with fun for all ages and know how to make your Galapagos voyage an amazing experience for the entire family. Planning a multi-generational trip-of-a-lifetime or another once-in-a-lifetime experience? Now you can add a first-on-the-planet edge to your adventure with the recent launch of Drone My Trip by our preferred partner, VIP Journeys. This unique new service pairs the latest technology with some of the most iconic, exotic and unspoiled destinations in the world. Drone My Trip gives travelers the freedom to tailor an itinerary and then set out on the tour of a lifetime, accompanied by a seasoned GoPro/Drone photographer to capture every unforgettable moment and unmissable panoramas. Shot in astonishing high resolution, travelers will return home to a professionally edited feature which takes all the stunning parts of their vacation and turns them into an incredible video, professionally produced and suitable for sharing online via YouTube. Take a look at some of the Drone My Trip footage in South America. For your next Family getaway let us cusom design the perfect escape.